“Just keep proper posture.” While it is no new revelation that having good posture can significantly improve the quality of your ride, for some, this is often easier said than done. With so many factors working against the average person these days, having good posture can seem a seriously daunting task. For many, working all day at a desk, frequently looking down at cell phones while texting or reading, and using unsupportive pillows (among many other causes) have left them with rounded shoulders, soft core, and a forward head—all positions detrimental to keeping good posture in the saddle. Before diving too far into stretches and exercises to keep good posture, it is helpful to actually get good alignment first, in order to understand what that feels like. The first part of this two-video series gives cues for placing the upper body into a proper position, and will work even if you are someone who struggles to implement traditional posture prompts effectively. (Plus, I’ve included in there my go-to, pre-ride upper body posture exercise that is guaranteed to leave the body upright and ready for action). After your body has a better idea of what is expected, specific muscle groups may be trained in order to make keeping good posture a mere afterthought. Stretching muscles that have become shortened due to repeated use, such as the lower abs and chest is a crucial tool for maintaining proper upper body arrangement. Far from technical, lengthening tight muscles usually involves holding two or three low-impact positions for just a few minutes. As shown in the second video, an exercise ball can be incorporated to stretch muscles which can often be difficult to fully extend otherwise. Equally as important as stretching tight muscles is to develop strength in muscles which have become weakened and are incapable of holding the correct position. Moves, such as those seen in the second video, which focus on training the spinal erectors (muscles that run parallel to the spine), mid/upper back, and abs (among others) will have the greatest effect towards achieving an effortlessly-held upright posture. Once the body is trained for keeping good posture without having to devote anything more than a cursory thought to it, it is then free to concentrate on the task at hand—in this case riding over fences, etc. 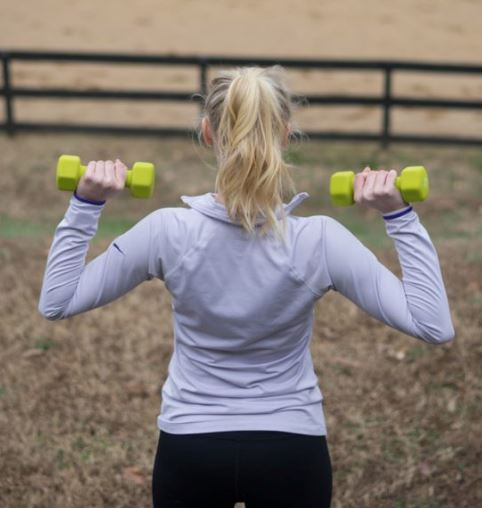 Not only will your body benefit from having proper posture (and not having to think about it), but then your horse, too, will likely find renewed performance from your improved position. It is a win-win situation for everyone, and one which can be easily attained through a combination of the non-standard cues and muscle conditioning found in these videos. written by: Shawn Staerker is a Corrective Exercise Specialist and Personal Trainer in Longwood, Florida, where he regularly works with equestrians of all levels to improve their strength, stability, and stamina.